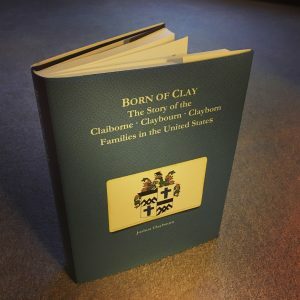 We are pleased to announce the publication of Born of Clay: The Story of the Claiborne · Claybourn · Clayborn Families in the United States. Clocking in at over 500 pages with detailed biographical information on thousands of individuals, this is an unparalleled history of the Claiborne – Claybourn – Clayborn families in the United States. Beginning with Joshua Clyburn in the late 1790s, this history gets progressively more detailed as the generations progress toward modernity. As early as 1906, Verner Marvin Claybourn began collecting data on the Claybourn Family, and on the English family from whom he believed the family descended. In about 1935 Harriette Pinnell Threlkeld became interested, did some research, and with Verner collected data on the hundreds of descendants of William Divine Claybourn, her great-grandfather. From their foundational core the Claybourn Genealogical Society published this one-of-a-kind book on thousands of individuals connected to the family. The book is printed on demand resulting in a purchase price of $115. There is no markup so it is sold at-cost. Click here to get your copy today!